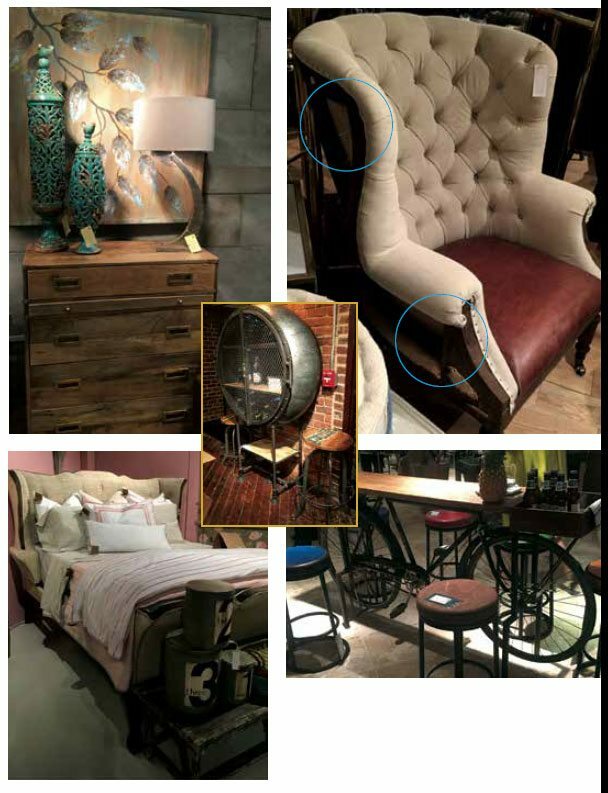 New designs dominated the recent Fall High Furniture Point Market – one of the largest furniture markets in the world. Manufacturers from around the globe showcase their goods from furniture to lighting, rugs and linens and much more. We spent 4 days there combing the buildings searching for new products for our studio projects and e-commerce boutique. The home furnishing trend continues to embrace the more “modern rustic and industrial” by blending materials within one piece such as woods, metals, stone, concrete and glass. Accent colors were minimized to small splashes such as a rug or pillow with an overall neutral design opposed to previous years where showrooms were bathed in stronger, darker neutral or bright jewel tone colors. Different furnishing styles and origins of furnishings were mixed creating more eclectic rooms, such as rustic, Asian, Modern and Traditional styles all in one setting. The “Belgian linen color” was the most dominate with splashes of turquoise, chocolate brown or a dark saffron gold. This look is one that crosses the demographics from Mountain Modern to Loft Living to the new Urban and Suburban “Spa and Serene” decorative direction. Touches of “antique or historical” were integrated throughout specific furnishing elements including the re-design of traditional pieces such as wing back chairs or chesterfield sofas that were covered with “antiqued or teastained” fabrics giving them a worn look. A trend that is still growing is the “Deconstructivist style” that leaves pieces torn apart, left unfinished with structures and framing left exposed. Repurposing continues to be both a decorative and artistic style where all sorts of common day elements are redesigned and given new life.